At Compassion Hospice, we honor all veterans – I had the extreme honor of meeting one of our local Army Veterans of the Vietnam War just this afternoon and saying thank you for your service . Times have changed, they didn’t come home with the respect and gratitude we try to show today. Below is a moving video from the people at moments.org. The Vietnam War marked a time of social unrest that divided our nation like never before. Service members returning home with physical and emotional scars were greeted with an unprecedented level of disrespect and dishonor. The courage and sacrifice of our veterans cannot be overstated. When you encounter them, thank them for their service. You never know how powerful those words may be. America’s veterans have done everything asked of them in their mission to serve our country, and we want to be there for them when they are faced with a life-limiting, terminal illness. We take great care to ensure America’s veterans receive the care and attention they need and deserve. 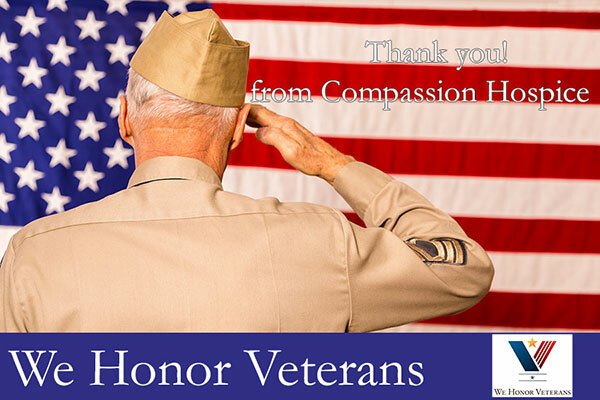 That is why Compassion Hospice takes part in the We Honor Veterans Program , a collaboration between the National Hospice and Palliative Care Organization and the Department of Veterans Affairs. We understand the unique issues that veterans and their families face and can provide the care (including nursing, counseling, pain and symptom management, medical equipment and supplies) they need. This care is integral to our “more moments” belief – with our team of highly skilled and compassionate members, we will treat you and your family with the dignity and respect you deserve. Call us today in our Beaumont office at 409-835-8357 or our Jasper / Lakes Area office at 409-383-5280 – we can discuss your wishes and goals for your care 24/7.